So I was stopped waiting to make a left turn, I see a school bus in opposite traffic with hazard lights flashing, not red lights or stop arm. It was about two car lengths away so I made the left hand turn. Bus driver didn't honk or anything. It appeared the bus was slowing down and made the right turn into the street I entered as well. This was not in an intersection btw. Do I do anything illegal? sunsetdrive wrote: Do I do anything illegal? No. Hazards are just hazards. Even if the lights were on and the sign swung open, you could make that maneuver anyways. I feel I should mention since I forgot to include that the school bus was not stopped, but rather driving, slowly with the hazards blinking. If that at all should matter, or change anything. Also thank you for the reply. It doesn't change anything. If the bus hadn't yet stopped and you've already completed the stop, you have the right of way. You don't have to wait for the bus and at that point you're just impeding traffic. There wasn't a stop sign for the school bus to stop at btw. 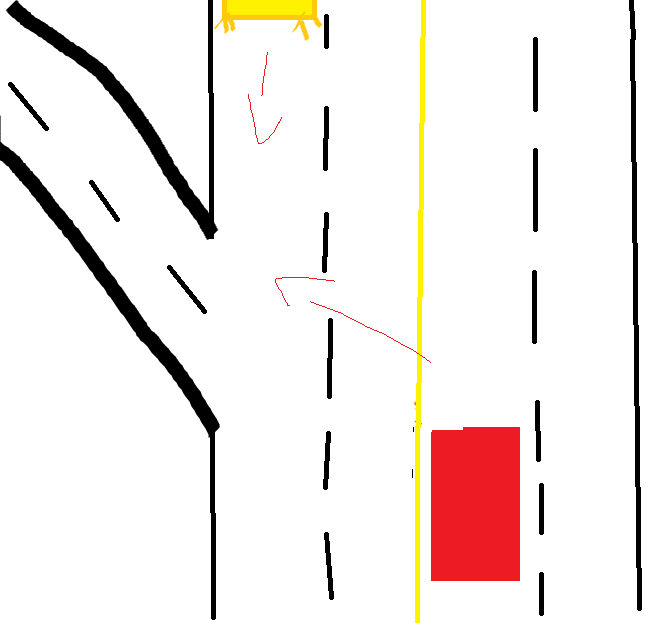 I included a crude drawing of what I was trying to explain If I was being unclear before, my apologizes. Hopefully the drawing makes it a bit clear. Sorry I had assumed this was at an intersection. You have to make the turn safely without being a danger to others. If you're behind the wheel, you should already be able to make that decision. If others have to compensate for your turn, yes you can be charged. yes i did make the turn safety, no one had to compensate. I was just wondering if the turn i made was okay when the school bus had flashing hazards going opposite of traffic. I'm sorry, is the Yes towards my the original question? Are you saying it was illegal? Sorry, just a bit confused.